Often the simplest solution is the most effective, and the Andon cord definitely falls into that category. The premise is simple: in the event of a potential problem, a team member on the production line can pull the cord to flag up the issue, stop the process and receive immediate assistance. The origin of the Japanese word translated ‘Andon’ comes from the use of traditional lighting equipment using a fire-burning lamp made out of paper and bamboo. The Andon was later adapted for use in manufacturing in Japan, where it came to mean a signal (ie a flashing light) to highlight an anomaly, such as a potential quality issue. When a defect was suspected, a signboard would light up indicating the workstation having a problem. The signal would also indicate that the system had been halted to allow the problem to be resolved. The Andon cord runs the entire length of the production line at TMUK’s Burnaston plant and is connected to an audio system, a prominent signboard and a flashing light – the Andon itself. As soon as the cord is pulled, the Andon board lights up with a number that corresponds to the member’s workstation. This enables the Team Leader to provide immediate assistance exactly where it’s needed. If the potential problem can be resolved during that member’s process time – the amount of time allotted for the vehicle to pass through that specific workstation – then production continues. If it cannot, the entire line will pause while the issue is investigated and resolved. Once resolved, the Andon cord is pulled again to restart the line. The Andon system ensures that any quality concerns are sorted out exactly when and where they occur, preventing a defective part continuing down the line and finding its way into a finished vehicle. The concept behind the Andon system originates from one of the Toyota Production System’s founding concepts, known as ‘jidoka’. The thinking behind jidoka is that by stopping the system, you have a chance to correct a problem or make the necessary improvements, rather than allowing an unresolved defect to continue down the line, impacting quality and potentially causing further issues. Making each team member responsible for the quality of their work in this way helps them to pass on a high-quality product to the next member on the line. Even though potentially stopping the entire production line seems like a costly measure – both in terms of time and productivity – identifying the root cause of the problem allows the issue to be eliminated and the manufacturing process improved. In the long term, this saves time and ensures high quality is delivered to the customer. 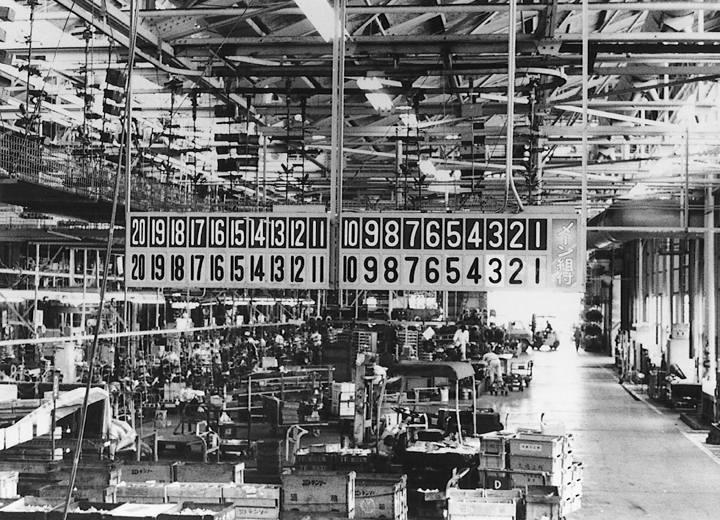 Toyota’s use of the Andon system dates back to 1950, and it was incorporated into the Toyota Production System, a philosophy that governs production in Toyota facilities down to this day. To discover more about TMUK at 25, see the full list of 25 Objects.